The Community Education program of the South-Western City School District has grown three-fold in recent years. The community continues to show great and growing interest in the programs offered. It is our goal to continue to offer a vast array of opportunities and experiences for those ready and willing to learn. For more detailed information please visit the community education sub-sites: Community Education Classes, GED, or ESL. 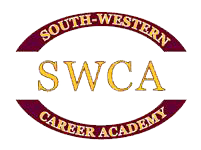 Stop in at the South-Western Career Academy's Business Resource Center if you would like to register or speak with our staff for more information. Education website, http://education.ohio.gov, or call 877-644-6338 to find out how to apply for the GED. • A no-cost opportunity to improve skills. The South-Western Career Academy is now an official State of Ohio testing and preparation center for community members training to take their GED. January 1, 2014 marked the launch of the new Computer Based GED® testing process which now costs $120. Fortunately, there are $80 GED test vouchers available to first-time test takers. To take advantage of this financial assistance, participants must contact a Career-Technical Planning District (like the South-Western City School DIstrict) for career and educational guidance prior to scheduling and paying for the 2014 Computer Based GED® test. How does it work? Contact Dr. Chris Shaffer at 614.801.3461 to find out.